This photograph was lifted from a good soul at http://anonopspub.blogspot.com. We repost it in good faith and would love to give further attribution, if possible. Great shot, whoever you are Anon Hispano! Drop us a line sometime. Ten years ago the United States signed the Dominican Republic-Central America-United States Free Trade Agreement (CAFTA-DR). According to the Office of the United States Trade Representative, CAFTA, like NAFTA (the North America Free Trade Agreement) before it, was intended to create “. . . new economic opportunities by eliminating tariffs, opening markets, reducing barriers to services, and by promoting transparency.” These are laudable goals, but for many in Central America, a trade agreement that was intended to foster the free movement of goods, services and capital to bring economic development has actually been a nightmare of state-sponsored violence, forced relocation, hunger, fear and isolation. That is a story that we intend to tell over the coming months in the pages of La Cuadra Magazine. Our argument will be that, despite assurance from the governing bodies and private investors, CAFTA-DR is far from a net-positive for the majority of the people of Central America and the Dominican Republic. In 2012 the Congressional Research Services of the United States wrote a report stating, “CAFTA-DR reinforces the idea that growth in trade correlates closely with policies that promote economic stability, private investment in production, public investment in education, infrastructure, logistics and good governance in general.” Yet, to anyone actually living in Central America over the past ten years, those claims (with the notable exception of increased private investment) don’t hold much water at all. For most Guatemalans (and Hondurans, Dominicans, Salvadorans, Nicaraguans and Costa Ricans) there has been no meaningful increase in public investment in education or good governance and the new infrastructure is often used just once by the campesinos: When they are forced to move off their land in search of a job in the city. The realty for much of the rural and urban poor in Central America, who live in the shadow of CAFTA, is that they see the multinational companies benefiting from their labor and their land, but then find themselves screwed at the end of the deal by sub-agreements that carve them out of the profits. Because of this, CAFTA has driven many of the crises in the region in the past decade. It has led to violence. It has led to internal and external migration. It has fostered a growing problem with narcotraffickers and local gangs. It has attacked the root identity of Mayans who believe — as strongly as a devout Christian believes in the divinity of Christ — that they are the people of the corn and that to rich international businessmen and politicians, that identity is for sale, that that identity can be owned and traded, and patented by outsiders who have neither knowledge nor concern about their beliefs. Yet, in the media, very little attention has been paid to those who have borne the greatest burden of this latest development in the global market. In that way, CAFTA-DR is a very old story, indeed. In 2002 President George W. Bush announced his administration’s intentions to pursue a free trade agreement with the countries of Central America. Shortly thereafter, Congress opened the door to the administration by “fast-tracking” the trade agreement. Fast-tracking grants the President wide latitude to negotiate complex foreign trade deals that, when completed with other nations, are returned to the Congress for an up or down vote. Fast-tracked trade deals cannot be amended or filibustered. If they could be, getting complex trade deals through the legislature would become a long and unwieldy process as congressman after congressman attempted to add amendments to, or block passage of, the omnibus bill. Negotiations between the United States and Guatemala, Honduras, El Salvador, Nicaragua and Costa Rica began in early 2003. Shortly thereafter, the Dominican Republic was added to the trade agreement that intended to break down protective tariffs in all member nations and open the national economies to importations and foreign direct investment. From its announcement, CAFTA was met with protest in Central America. Citizen-action groups across the region organized demonstrations to denounce the United States and the trade agreement. It seems that after a century of United States hegemony in the hemisphere, there was little trust in reserve from most citizens in the region for Uncle Sam. Said another way, if students of the United States like to recall the Good Neighbor Policy of Franklin Delano Roosevelt, students of Central American history tend to remember the Bad Neighbor Policies that existed before and after that brief window of international good will. By 2005, President Bush had concluded negotiations on CAFTA-DR and it went to Congress for an up or down vote. In the Senate the result was 54-45 in favor and as there was no possibility of a filibuster it passed without incident. The vote in the House was far closer and it was achieved with high drama. The final vote was 217-215 in a Republican controlled chamber. Normally, voting is held open for just 15 minutes — but in this case, House Speaker Dennis Hastert (R-IL) kept the vote tally rolling for nearly an hour, with the final, decisive vote coming in after hours of arm twisting and back-room negotiations just before midnight on July 28. Speculations on the price tag of all that horse trading easily climbed into the tens of billions of dollars, but as there was no record kept of who got what, the public will never know for sure. President Bush signed the trade agreement into public law on August 2, 2005. The Central American nations and the Dominican Republic began the process of ratification in 2006, when El Salvador committed itself in March. Honduras and Nicaragua followed in April, with Guatemala and the Dominican Republic ratifying the trade agreement in May and June, respectively. Costa Rica held out until 2009. At the April 2, 2005 signing, President Bush said, “By leveling the playing field for our products, CAFTA will help create jobs and opportunities for our citizens. As CAFTA helps create jobs and opportunity in the United States, it will help the democracies of Central America and the Dominican Republic deliver a better life for their citizens. By further opening up their markets, CAFTA will help those democracies attract the trade and investment needed for economic growth.” In many ways, however, those promises never manifested and CAFTA has fostered increased dependence on exports from the United States and great dislocation in the individual signatory nations. This reality on the ground has led to increasing social conflict in Central America. Guatemala erupted in protest at the end of August 2014 over the passing of a law that allowed Monsanto to sell seeds in the country. Monsanto refers to itself as a “sustainable agriculture company,” a description that causes dark, derisive laughter in this part of the world. For nearly ten days the streets of Guatemala City and many rural departamentos (departamentos are roughly equivalent to states in the USA) saw one of the largest mobilizations of people in recent history. The Monsanto Law, officially called the Law for the Protection of New Plant Varieties, was passed by the Guatemalan legislature in June during the World Cup, to assure that as few folks as possible would be paying attention. It looked to bring Guatemala into compliance with Article Ten of CAFTA, which protects the rights of investors, but it does so in an ingenious and highly suspect manner. The Monsanto Law would give multinational agricultural companies explicit rights not only to their own seeds — most of which are self-terminating, requiring the farmer to return every cycle for more seeds — but to any new varieties of seed that contain genetic information from the agricultural company’s seed. That’s a bit tough to get at first, but it is profound. The transgenic seeds by a company like Monsanto are generally designed to be self-terminating, e.g. you cannot harvest plantable seeds for the following year; you have to buy more. In addition to this, those seeds can cross-pollinate with a farmer’s reserve stock of seed corn and any resulting variety of that natural cross-pollination would belong to the multinational company. Planting such a seed — which could easily happen without the farmer’s knowledge — without payment to a company like Monsanto would expose a Guatemalan campesino to a prison term of one to four years, and fines between $130 and $1,300 US. The law, being held in suspension by the courts, could be outright repealed by the legislature, and there appears to be some commitment from several political parties to do so. However, it is difficult to see what options Guatemala has in the long run. The provisions in the Monsanto Law are obligations under CAFTA-DR, and the United States is likely to bring great pressure to bear in an effort to defend the rights of their corporations. 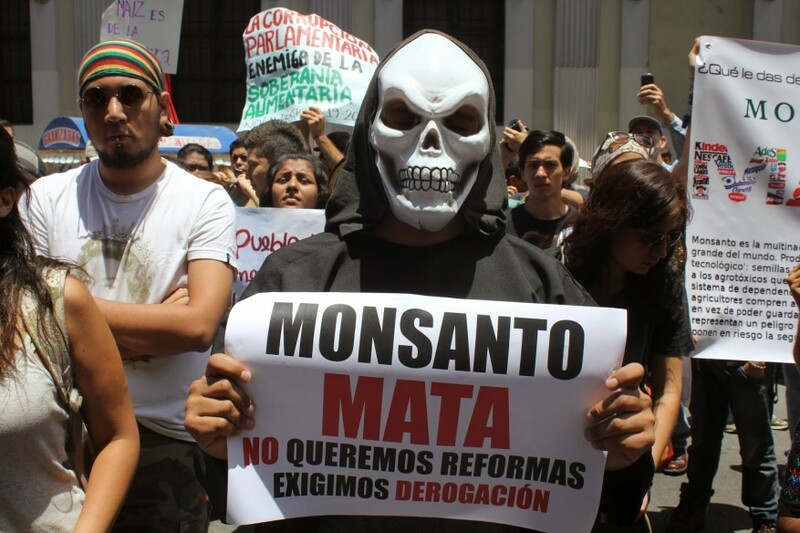 Put simply, the longer Guatemala resists the Monsanto Law, the greater the danger that other areas of CAFTA authority will be challenged either in Guatemala or other nations that are party to the trade agreement. Ultimately, Guatemala could be ejected from the trade agreement. This is neither lost on, nor entirely unwelcomed by, those organizing against CAFTA. It is difficult to square such realities with promises of governmental transparency and a better life for all. The social conflict and protest created by the law highlight one of the major impacts of the trade agreement in Guatemala and other Central American countries: that what is good for international business isn’t always good for the society. In this sense, the trade agreement has led to the breaking of social norms in Guatemala and other Central American countries. Furthermore, the rights of investors under CAFTA have other grave implications in the fields of security, mining, hydroelectric energy production and agribusiness that bode poorly for Central American societies. Over the coming months, each will be subject to analysis, but for now let us conclude with some notes on CAFTA’s impact on the migration of Central America populations both internally and externally and, finally, what we will call The Business of Insecurity. Most sectors of Guatemalan society have been sorely affected by CAFTA-DR, with the agrarian sectors being the hardest hit. Today small farmers from Huehuetenango or Sololá must compete with cheap, subsidized corn imports from the United States. Understand that. Since corn grown in the United States receives a government subsidy from Washington, it is actually cheaper in Guatemala than is much of the locally grown Guatemalan corn, which is being priced out of the market. A similar process occurred in Mexico under NAFTA, leading to the loss of two million farm jobs as of 2011, according to Tim Johnson writing for McClatchy Newspapers at the time. Guatemalan farmers, much like their neighbors to the north in Mexico, face a devilish choice: Should they sell their land? Should they stop growing corn — a staple part of their diet — and try their hand at growing a product for export? Should they stay and struggle on the land, or should they migrate to urban centers in their country, or risk the long and terrible journey to the United States? What a terrible set of choices. As a result, many farmers have chosen to sell their land, move into cultivating products for export, or have made decisions to migrate to urban centers or to hazard the dangerous journey to the United States. In this sense, just as NAFTA created one of the largest migrations of human beings in recent history, so too has CAFTA. We will cover the details of this migration and its tribulations in an upcoming issue of La Cuadra Magazine. With a population in such constant motion between work that no longer is sustainable and the hope of new jobs that have still not materialized at anywhere near sufficient numbers in urban centers, there has been a radical expansion of criminal networks throughout many CAFTA nations. This lack of opportunity has fueled the growth of gangs, known as maras in the vernacular. On the local level, the maras run extortion rings and drug networks. On the national level, they have effectively taken over entire departamentos. On an international level, los narcotraficantes are effectively using the more relaxed system of international trade under CAFTA to their advantage as much as possible. This criminalization of a significant number of citizens has led to the need for greater security, which, as a final head-scratcher caused by the knock-on effects of this free trade deal, has fully unbalanced the nature of policing in, at least, Guatemala. In this, our host country, the National Police of Guatemala (PNC) employs approximately 25,000 officers, but there are between 100,000 and 150,000 private security guards employed across the nation. All of them are armed. Few of them are trained. In a land this terrified of its own citizens and the actions of its neighbors, there may now be more trade, but it comes at a price. From a lack of personal security to the fear of losing one’s land and heritage, CAFTA is anything but free. Read Part II, La Cuadra’s Inside look at CAFTA: Part II — Forced Relocation here. Jeff Abbott is an independent journalist based in Guatemala. He has written for Truth-Out, VICE, Open Democracy, The North-American Congress on Latin America and Upside-Down World. La Cuadra is honored to have him on the team and encourages everyone to read his work, buy him mezcal and follow him at Twitter @palabrasdeabajo.